Murray State University, located in Murray, Kentucky, was founded in 1922 by an act of the state general assembly as a liberal arts and pre-professional, co-educational, state controlled institution. It was established as Murray State Normal School and Teachers College, Murray State Teachers College, Murray State College, and in 1966 it became Murray State University. At the time of the Installation of Epsilon Tau Chapter, enrollment was 2,588 and the college president was Dr. Ralph H. Woods. On September 15, 1973, Dr. Constantine W. “Deno” Curris, Kentucky ’62, became the sixth president of MSU, and was at that time the youngest president of a state college or university in Kentucky state history. Delta Alpha Fraternity was founded by five men on February 3, 1948, at Murray State. It was the first fraternity in the Kentucky state college system. 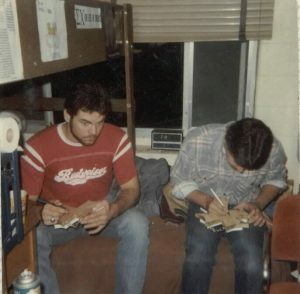 Two of the Delta Alpha founders were members of Sigma Chi. One of those, Raymond J. “Buddy” Hewitt, Vanderbilt ’49, was instrumental in encouraging the group to petition Sigma Chi rather than accept affiliation offers from other fraternities. In the spring of 1958, President Woods instructed the men of Delta Alpha to seek affiliation with a recognized fraternity. 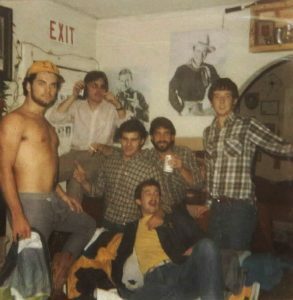 After considering several “old line” fraternities, the group voted unanimously in April of 1958 to petition Sigma Chi for a charter. After a year of concentrated and determined work on the petitioning process, 88 undergraduates and 35 alumni of the Delta Alpha Fraternity were initiated on April 25, 1959, as the charter members of the Epsilon Tau Chapter of Sigma Chi. The ceremonies were held at Carr Health Building and the Fine Arts Recital Hall. In the evening, the new Sigs and their guests assembled at the Women’s Club House in Murray for the Installation banquet. Dr. W. Everett Derryberry, Tennessee-Knoxville ’28, president of Tennessee Polytechnical Institute, was the guest speaker. Also participating in the festivities were Chief Installing Officer and Executive Committee member Norman C. Brewer Jr.; AES William L. Denton; Assistant Grand Praetor of the Kentucky-Tennessee Province Tom J. Porter; Alumni Investigating Officer Dr. Roland H. Myers; and Future Grand Consul Dr. George H. Jones. This section was taken from History of the Sigma Chi Fraternity: 1955-1980, by Grand Historian Douglas Richard Carlson, Minnesota ’73. 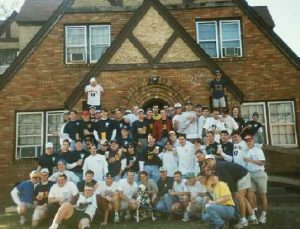 The original Murray Sigma Chi House.